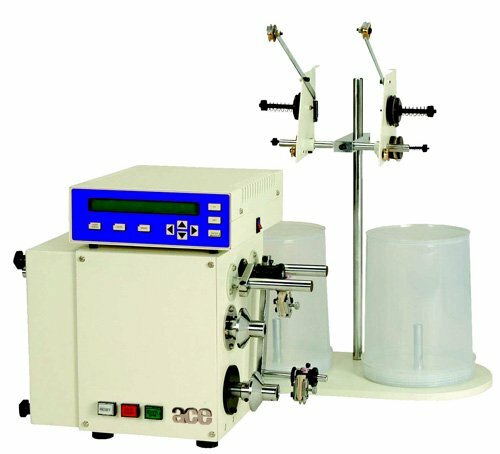 Armature high speed coil winding machines are favored by the giants of the industry. We utilize high quality material and technology to manufacture our products. This coupled with our 15-year strong expertise has allowed us to create precise yet completely programmable machines. SPEED (MAX.) 9000. Speed can be programmed in percentage increment or decrements. Winding speed can be altered while the machine is in motion. Also features an integrated speed knob to quickly change the speed manually. DISPLAY All operational information available at one glance on the superior LCD display. 40 X 2 Backlit LCD. PROGRAMMING Also allows for programming of several menu items. MEMORY 95 programs consisting of 9 sections each can be saved in the machine. COUNTING Precise counting functionality allows for up0down counting as well as tracking of wire guide. PRODUCTION COUNTER Features a built-in production counter for superior operational control. SPEED INDICATION Ensures high quality winding with complete control of the speed. 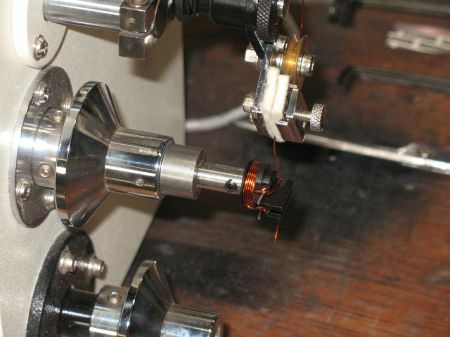 Machine flashes relevant information when high levels of speed (~ 800-900 RPM) are achieved. SECTION WINDING Each program can consist of 9 winding sections. Since there are 95 programs, it totals to 855 winding sections. WINDING DIRECTION Winding direction can be programmed in accordance with the application. Options of CW/CCW winding are available. CONTINUOUS DISPLAY The display provides up-to-date continuous information about the number of turns completed as well as other data. This helps in monitoring the operation more effectively. ACCELERATION Acceleration and deceleration with reference to the number of turns can be programmed. PROGRAM PARAMETERS Offers complete flexibility to program all winding parameters. APPLICATIONS SMPS and Small Transformers, WWR, Ignition Coils, Multi Section Coils, Inductive Coils, etc. BRAKE Features a double brake that is extremely efficient and provides durable functioning. The brake’s functionalities can be programmed. TAPPING An incredible 855 taps in total. Each of the 95 programs can consist of 9 taps. POWER SUPPLY Requires SMPS supply to power the logic circuit. This ensures continuous functioning of the machine over a wide range of voltages. LAYER STOP This can be programmed for each winding variation individually. WIRE PITCH Can be easily programmed in steps of 0.01 mm. TURNS ACCURACY Features highly accurate winding with 0.05 turns. Also available is the option to wind in steps of 18 angular degrees. MANUAL BRAKE Also features the option to handle the brake manually for better control of the spindle. WIRE-BREAK STOP This safety feature ensures that the machine stops if the wire breaks. This reduces strain on the machine and diminishes the possibility of faulty functioning. TRAVERSE OFFSET This winding position can be programmed. TRAVERSE HOME This position can be chosen as left or right depending on how you would want the coil to be wound. WIRE GUIDE Starting position can be adjusted by adjusting the wire guide. Precise wire guide adjustment possible in these machines.